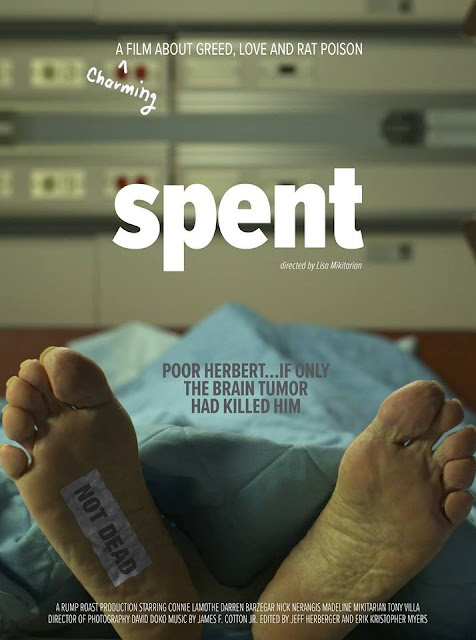 Lisa Mikitarian's feature directorial debut Spent, about an unliked husband father whose brain tumour comes good on July 4th, opens this Friday at the Arena Cinelounge and On Demand. I’m a writer/storyteller by trade who has a serious visual/auditory bent. When my publisher had me make a promo video for a book that was going to be released, a light bulb went off. If I wanted to tell a story to the breadth and depth of what I had within me, I should be creating the story in film. Lot of support along the way? More than a lot - from a friend who showed me the mechanics of screenwriting, to the production manager who schooled me on the ins and outs of making a film, to the people who provided amazing locations, to the DP who gave me director-related material to study - I could go on. The list of people who supported me during this endeavour is long. Did you have to work other jobs - maybe you still do? - in between projects? Or has it got to a stage where filmmaking is putting the food on the table? No food on the table - no scraps, no breadcrumbs. In fact, in film terms, I don’t even have a table. I’m hoping to make something, however modest, when the film’s released in December. In the meantime, I’m working on a limited mini-series, while taking on short-term gigs with Craigslist. How has the industry changed since you started in it? I’ve been in the industry for all of two minutes, but even in that span of time, I see the industry as a glob-like entity that is steadily increasing its power and speed of morphability. I should delete this line, but I don’t always do what I should. From the equipment to the distribution, the landscape is anything but stagnate. Has it gotten easier over the years? Is there a particular film that really helped kickstart your career? Spent is my first film, and I hope it kickstarts a career. It isn’t perfect, but it’s solid. I hope people look at it and wonder what I will and can do next. Do you have a favorite project that you’ve worked on? Maybe it was one that never even came to fruition? The mini-series I’m working on now is my favourite. With Spent, I was learning the mechanics of screenwriting. I didn’t actually plan on it becoming a full-blown, real film - that part unfolded afterwards. If I had known we were making a film, I would have written a much-different script. Like the one I’m writing now. One that is layered, one that is both plot and character driven. One with an original premise that allows for all sorts of exploration. One that has the ability to resonate in the bosom. Ha, I should delete “bosom” - my daughter hates it when I use that word. And what appealed to you first and foremost about the film? With Spent, I love the artistry, the musical score. Maybe I was concentrating on those elements because it was the first time I was able to incorporate them into storytelling. I loved working with David Doko, the cinematographer, and James F. Cotton Jr. who wrote the music score. They brought more talent to this project than a first-time filmmaker deserved. How much time did you have your co-stars mingle together before filming, to get that chemistry down pat? We produced Spent in a rural community of the Shenandoah Valley of Virginia. Several of the actors had worked with one another before we started shooting. We didn’t have much time for mingling or rehearsals, but I took time with the lead actors to understand their vision of their characters, and share with them mine. The result was well-wrought, unforced performances. The actors became the insane characters I’d written and never looked back. We enjoyed a genuine camaraderie on set that we missed long after we were done shooting. Is there a moment in the movie you found particularly hard to film or really felt for your actors? Because the film is a charming dark comedy, it never gets too heavy, so from an emotional POV, the only difficult scene was the picnic scene, the climax. That was also the most physically challenging scene as a sudden and severe thunderstorm cropped up in the middle it. This was a night shoot, which meant that we scrambled to get the electrical, the actors, the props, everything indoors. We only had that night to finish and had already lost a lot of time. Resetting was difficult, everything was wet, and everyone was tired. But we made it through, and the end of the climax scene does everything it should and more. What do you hope audiences get out of the movie? The overall story is about the complexity of money and relationships. Can a woman ever feel free if she’s not financially independent? But at its core, Spent is about family, and how flawed the individual members are. What wife hasn’t wanted to kill her husband? There are circumstances, no one should live with, but maybe there are times we should think twice before chucking everything we have away.